Solar Cell Under the Scope Using EBIC! If you’re a curious person, much like me, you will definitely appreciate this electric wonder! Using a scanning electron microscope (SEM), a current can be applied to a solar cell allowing viewers to gaze upon the mesmorizing distribution of charge flowing on the cell’s surface. How you may ask? Simple! We use a SEM technique called electron-beam induced current (EBIC). When the electron beam in a SEM strikes the surface of a semi-conductor, it generates electron hole pairs (in our case, the semi-conductor is simply the solar cell). The p-n junction field inside the semi-conductor causes the electron-hole pairs to separate, drifting the electrons to the n-side and holes to the p-side. A current amplifier is introduced to connect the p- and n-sides. This connection allows the electrons and holes to begin flowing, inducing a current on the surface of the solar cell. Finally, the output of the current amplifier is utilized as the imaging signal for the SEM and observation of the charge distribution is possible. 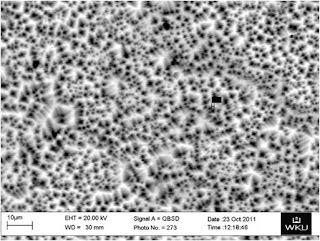 The purpose of the experiment was to determine the efficiency of the charge distribution on the surface by observing any topographical defects. With the assistance of Martin Klein (owner of Ellcie) and engineer Peter Marienhoff, Dr. Edward Kintzel of the Nondestructive Analysis Center executed the experimental setup of EBIC. 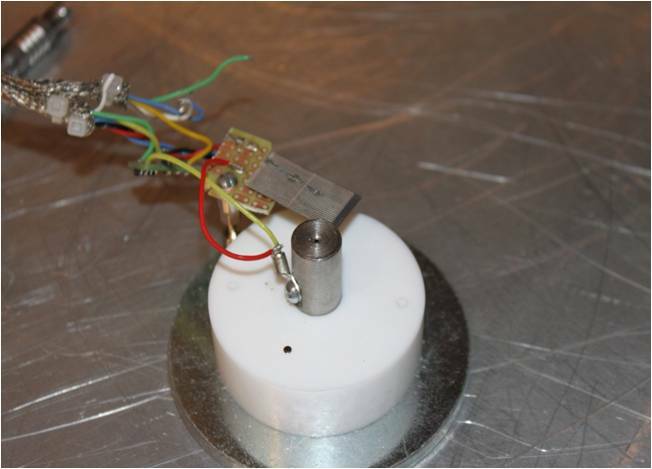 The image below shows the Solar Amplification System (SASy) that they built and the solar cell to be investigated. 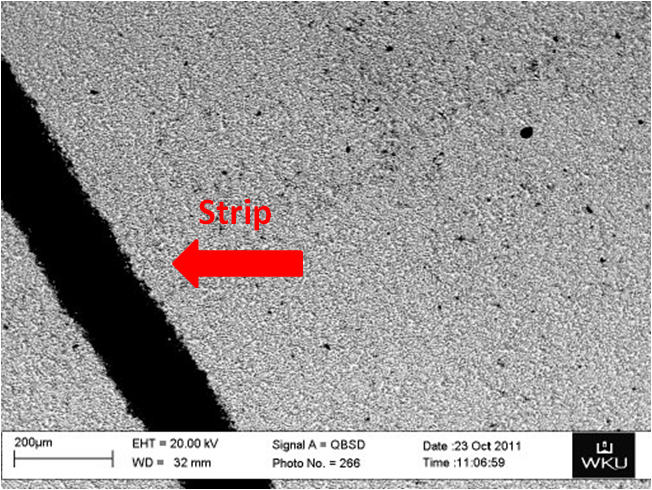 Image above shows Solar Amplification System (SASy), Solar Cell, and Faraday Cup. A Faraday cup was also constructed to characterize the electron beam. Faraday cups are metal conductive cups designed to catch the electrons from our beam and then use the resulting current to determine the number of electrons initially striking the cup. 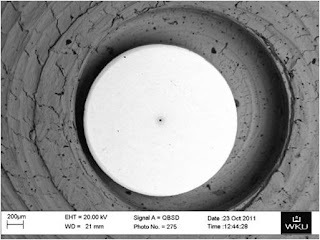 The SEM image below was taken to demonstrate the unique deformation of the drilled metal casing holding the faraday cup. The following images show the illuminated surface of the solar cell when EBIC is in action! Each consecutive image is increasing magnification. The initial image shows areas of defects in the surface, revealed by the darker regions where charge is not flowing. Potential causes or these defects may be related to dirt on the surface or scratches made during the manufacturing process. Eliminating these regions would enhance the efficiency of charge distribution. Paralled silver strips aligned solar cell appear dark next to the illuminated charge! Magnified image of the charge distribution! Magnified image of charge distribution! Notice the intricate pathes in which the charge travels! Besides high resolution imaging of the surface, we also did a chemical analysis using Energy Dispersive Spectroscopy (EDS) on the solar cell. This SEM technique provides the ability to not only recognize elements present, but also create mappings of their locations and their percent composition. Below shows two different regions examined: a silver strip (conductive region) and a region of silicon (non-conductive region). Shown left: Percent composition of elements present. A special thanks to all those who attended the WKU Physics Public Night at the Nondestructive Analysis (NOVA) Center. We had an awesome turnout with approximately 25 people! Dr. Edward Kintzel presented a PowerPoint demonstrating the unique capabilities of our instrument as well as previous images collected using our large chamber scanning electron microscope (LC-SEM). Attendees had the opportunity to peer into the large chamber through small windows and view the SEM in action! Previous samples such as coins, meteorites, impactites, fossils, brake rotors, a second generation ZR1 prototype engine block from Corvette, a bullet proof vest plate, and a Fresnel lens were all on display! Dr. Kintzel and I both thoroughly enjoyed all the eager questions and curious young minds! We hope everyone had a great time and look forward to answering any further questions or comments anyone may have! Above Image shows a panoramic image of the group listening to Dr. Edward Kintzel, the Director of the NOVA Center, as he delivered a presentation explaining the significance and exciting capabilities of the LC-SEM. Recent SEM images were also displayed. If you have any additional photos you would like posted on the blog, pertaining to the public night, feel free to shoot Nova Girl an email at wkunovacenter@gmail.com. Falling stars, more commonly known as meteors, are constantly striking the Earth’s atmosphere. The fragments of cosmic debris robust enough to survive the fiery Earth’s atmosphere and strike the planet’s surface are referred to as meteorites. If a meteorite is large enough to form astroblemes (giant craters), the catastrophic impact will transform the terrestrial surface materials into metamorphic rock by means of extreme heat, pressure, and shock waves. The initial collision of the meteorite melts the rock, sand, or earth it impacts and splashes it around like boiling taffy. Simultaneously, contact parts of the meteorite melt, mix, and cool with the earth, resulting in the formation of impactites. Impactites, shown below, vary in size from microscopic to as large as walnuts. So why are impactites so important? Meteorites, which are predominantly made of iron, rust and decompose over time. Impactites such as melt glasses, breccias, and shatter cones live on as remnants of the impact events. Even after the meteor and giant craters themselves vanish, impactites leave traces of the original meteorite and cataclysmic occurrences. Studying these unique rocks provides evidence of our planet’s brutal history and the momentuous events Earth has endured. The meteorite and impactites we scanned at the Nondestructive Analysis Center are fragments of the Canyon Diablo in Arizona. The original meteorite presumably struck Arizona approximately 50,000 years ago. The meteorite and impactites were discovered around the outer edge of the crater. The meteorite is composed of 90% iron and 7% nickel with minor amounts of cobalt, copper, chromium, platinum, gallium, palladium, and gold. The Large Chamber SEM at WKU Nova Center previously collected images of the impactites shown above. 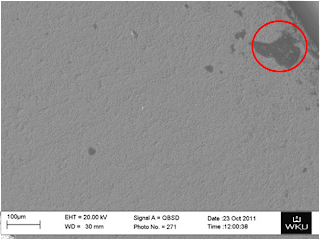 An elemental analysis on the impactites, soon to be carried out using energy dispersive spectroscopy (EDS), should reveal a mixture of elements present in the meteorite as well as earthly substances. Initial images reveal interesting designs like the Widmanstätten patterns in the microstructure. The impactites, although different textures, both appear uniform in color signifying an even mixture of components during the liquid transformation of the earth and meteorite. Ever seen a cracked brake rotor before? If you are a racing fan it is likely you have. We recently scanned a Z06 Corvette drilled brake rotor with the Large Chamber Scanning Electron Microscope (LC-SEM) at the WKU NondestructiveAnalysis (NOVA) Center. Due to our microscope’s unique size and positioning system we were able to place the entire rotor within the chamber without cutting or destroying the rotor itself. In fact, our chamber is large enough to accommodate any sample up to 650lbs or 1.5 meters in diameter. The owner of this Z06 stock form car extensively used it as a track car and ran it on run-flat street tires. The rotor has suffered serveral serious stress fractures on the surface due to natural wearing and exposure to extreme heating conditions. All rotors eventually warp, crack, and cause vibrations after varying periods of time as a result of internal stress and uneven temperatures in regions of the rotor. A significant observation in drilled rotors is the stress fractures occurring primarily around the holes. A drilled hole interrupts the grain structure of the metal rotor and when extreme thermal conditions are generated these holes expand and contract rapidly, allowing reformation in the metallic structure. When the brake pad slams against the turning rotor, stress is directly applied to the rotor and fatigues the drilled holes. The images show how the cracks form radially along the outer edge holes and suggest that less stress is applied to the inner radius holes due to fewer fractures. Taking a closer look into a drilled hole revealed detailed images of the iron grains pulling directly apart. Had these fractures occurred instantaneously we might expect to see two rigid walls. However, the images suggest these fractures slowly pulled further apart over extended time due to the alignment of the grains normal to the fracture walls. The apparent decrease in diameter between the fracture walls as it protrudes away from the drilled hole simultaneously supports the likelihood that the crack forms over time.